Shake and fold; two words that I hope will be seared into your mind by the end of this blog entry. These words have fundamentally changed my life (or at least the way I dry my hands with paper hand towels). Changing my life might be hyperbole, but I literally put these words into action every day. I like to think of myself as an environmentally conscious person, but I have to admit, before watching the video below I was a certifiable paper towel glutton. 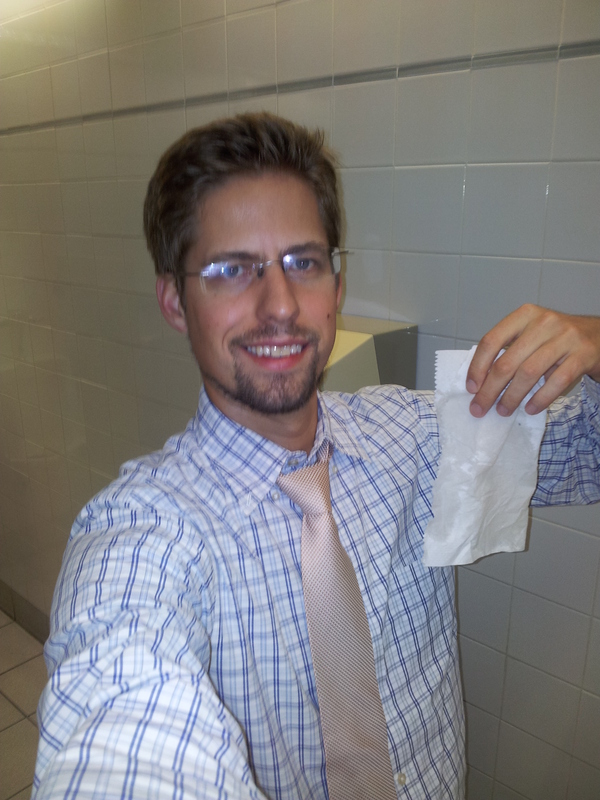 Every trip to the washroom I would end up yanking three or four paper towels without a second thought and chucking them in the garbage – that was just the number of towels I “needed” to get my hands dry. It turns out I was mistaken and one towel can get the job done – all I needed were two simple words: shake and fold. Take a look at the short video below for an entertaining demonstration of the shake and fold technique. Paper hand towels are typically made out of recycled material that has been through several generations of use. As a result, the fibers of the paper have been broken down to the point that they are too short to be woven into new paper products and therefore, they can’t be recycled again. However, the short fibers also enable rapid decomposition, so many facilities have programs in place to compost used paper towels. It is important to note that even where towels are composted there is still a strong incentive to conserve. Composting paper has the positive impact of diverting material from landfill and producing a useful product, but it does not change the fact that decomposing organic material (including paper) produces methane gas. Methane is a greenhouse gas with a global warming potential more than 20 times higher than that of carbon dioxide. Some landfills and composting operations recover this gas and flare it off or burn it in a gas turbine to produce electricity and heat, emitting CO2 and reducing the global warming impact compared to emitting methane. So, although composting paper is better than sending it to landfill, the fact remains that every discarded paper towel is producing a negative environmental impact. From a manufacturing standpoint, large amounts of water and energy are consumed in the manufacture of paper hand towels. Towels made from recycled materials, are less energy intensive to manufacture than virgin towels, but significant energy is still required. According to the American Forest and Paper Association, manufacturing one tonne of paper can consume up to 44,000 liters of water. According to the EPA’s Energy Star performance indicators for pulp and paper mills, the average mill uses 363 MMBTU of energy per ton of paper produced, equivalent to 8,400 cubic meters of natural gas. More energy is consumed in transport to site, and further energy is consumed when the towels are trucked off as waste. The pulp and paper industry is one of the top five industrial consumers of energy and polluters of air, water, and land in Canada and the US. The total reduction in paper hand towel use is 103,500kg, equivalent to 2,400 cases of towels or 103.5 tonnes of waste – Shake and fold! The environmental benefits are clear – 103.5 tonnes of material that doesn’t need to be trucked around, and the potential to save up to four million liters of water and 800,000 cubic meters of natural gas in manufacturing. As is often the case, the environmental benefits come with a large side order of economic benefits. The cost savings associated with reduced hand towel use can be calculated by looking at the avoided cost of purchase and the avoided cost of disposal. Hand towels typically cost approximately $75 per case (assuming 12 rolls per case, 800ft per roll) and waste disposal costs UHN about $71 per tonne, meaning that cost savings from implementing the shake and fold technique could result in annual savings of $187,000 across UHN. This is a conservative estimate, since many hospital employees wash their hands dozens of times per day (compared to the assumption of five times per day). By now you are probably asking yourself “Who is this guy and why does he care so much about paper towels?” I’m glad you asked – my name is Mike Kurz and I am the newest member of UHN’s energy management team. I will largely be focused on improving the energy efficiency at the recently acquired Toronto Rehabilitation Institute. As a graduate of mechanical engineering at U of T, I have previously worked in the energy efficiency industry, with a focus on renewable energy and water conservation. I have worked on many diverse energy efficiency projects, including university campuses, social housing portfolios, municipalities, and hospitals. I trust these experiences will be useful in evaluating energy savings opportunities within the UHN network of buildings. I am also a strong proponent of conservation in my day to day life – I have not commuted to work by car since 2006 (in fact, I don’t own a car), I installed programmable thermostats in my apartment to conserve heat, and I purchase all my home electricity through a renewable energy reseller, meaning that all of the electricity I consume is offset by an equivalent amount of renewable electricity injected into the Ontario grid from a renewable energy generator (such as wind or solar). I hope to contribute to the strong and growing culture of conservation and efficiency that already exists at UHN. And remember, Shake and Fold! This entry was posted in Beyond Talkin' Trash and tagged paper reduction, paper towel, shake and fold. Bookmark the permalink. Hello Mr. Kurz, since my class used some of your ideas when exploring which hand drying method (hand dryers vs paper towels) was more effective and which had fewer environmental impacts, I thought you’d enjoy watching the retrospective iMovie clips that we made together. https://youtu.be/jNQVqOSAum4 (they advocated for more energy efficient hand dryers) and http://youtu.be/ScBgSf4vgX4 (they became “shake and folders” and are looking to spread the word). Enjoy! These are private projects and are not meant to be shared or posted elsewhere (at least not for now). Hi Rob, I watched the videos and they were hilarious and informative! I think it’s great that you are working to teach conservation with your students.